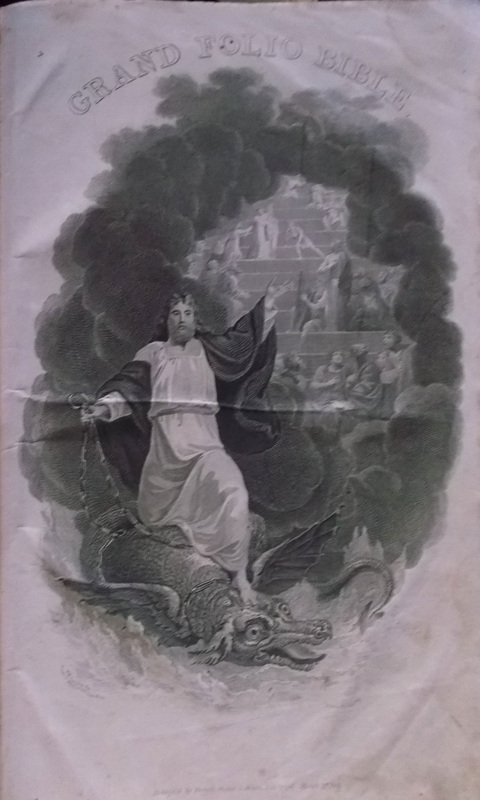 by John Brown;- Published by Thomas Kelly;-London 1824;- Folio;- The Old Testament is dated 1824 & New Testament is dated 1833 both are published By Thomas Kelly;- Original brown leather fading but needs TLC. Hundreds of Illustrations throughout. 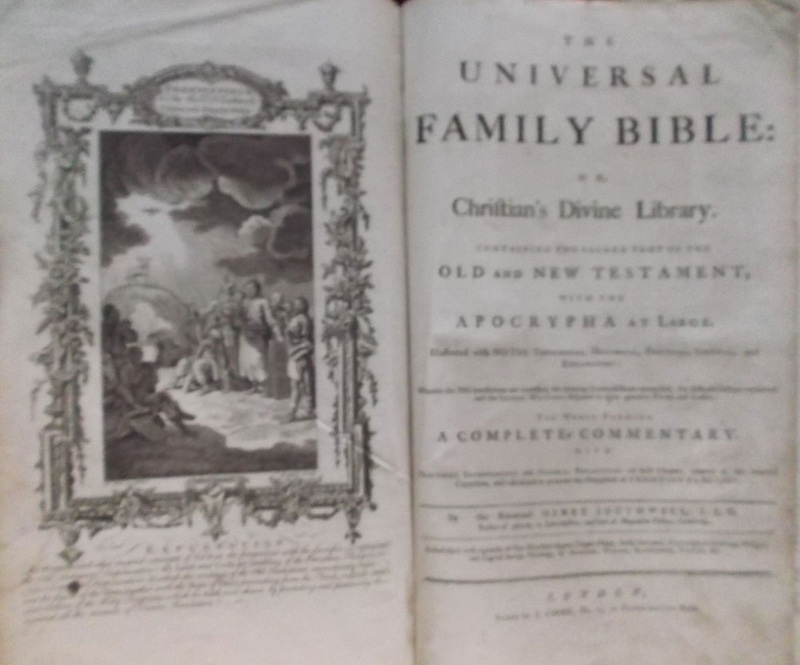 The Christian New & Complete British Family Bible ;- Folio 1770. By Paul Wright 1770;- Printed by Alex. Hoggs;- London;-1770;- Folio Illustrated though-out the 200 Engravings including Maps;- Original Swede leather binding. By Henry Southwell, Published in London by J. Cooke 1773;- Original Swede leather binding;- Folio, Herbert 1225;- One hundred elegant copper-plates. by Adam Clarke;- Published by the Caxton Press;- Liverpool 1813. Folio;-Herbert ;- 1577;- Hundreds of illustrations. Original dark brown leather binding with gilt lettering to the spine..a nice original copy 1st. edition. of Adam Clarke. 6. The Holy Bible 1751. 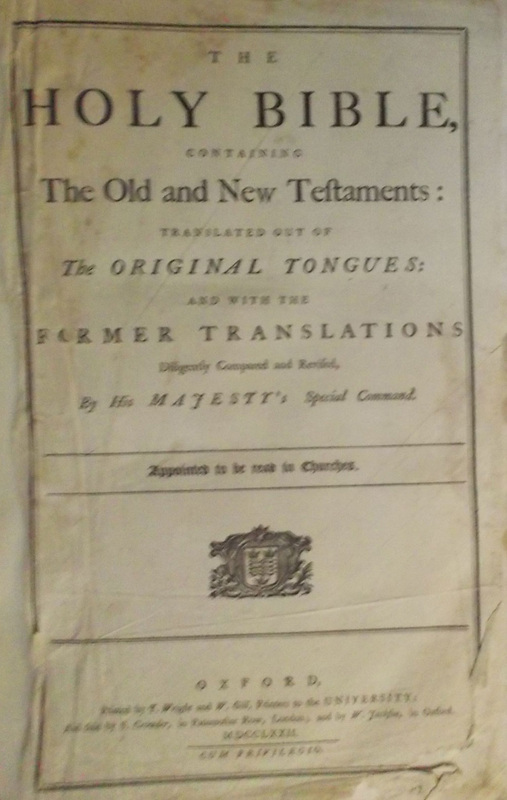 Herbert;- 1091;- Published by Thomas Baskett 1751. London;- Folio.... Needs Binding and TLC. 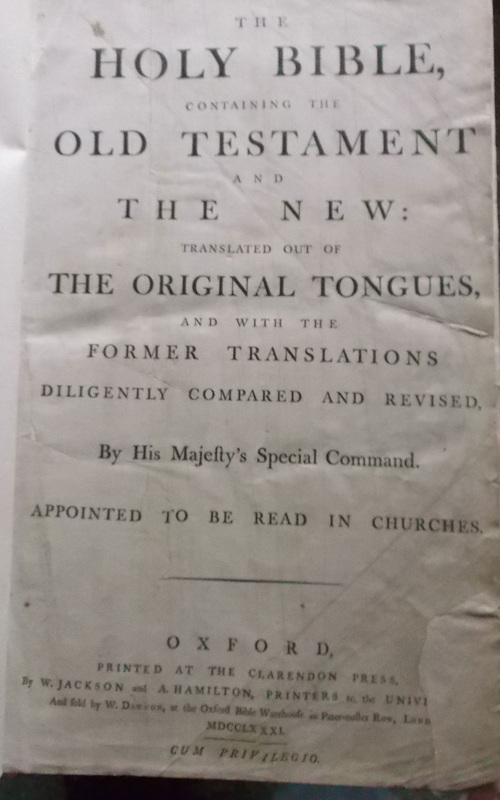 Published by W. Jackson and A. Hamilton;- Oxford, The Clarendon Press 1781... NOW THIS BIBLE IS NOT LISTED IN HERBERT IT DOES NOT EXIST. BUT THERE WERE 3 COPIES PRINTED AS A SPECIAL ORDER. SO HERBERT DID NOT LIST IT...ITS THE RARIST BIBLE AROUND. The Oxford University have no copy..This is the only one in Private Hands. This is the original 1611 King James Bible which had its celebrations of 400 years in 2011. To the most high and mightie Prince, James by the grace of God King of Great Britaine, France and Ireland, Defender of the Faith, &c. The translators of The Bible, wish Grace, Mercie, and Peace, through Jesus Christ our Lord. £250,000 for one of the Rare Bible's in the world, only twenty complete copies known, with original Map, seven are known to have the Map. 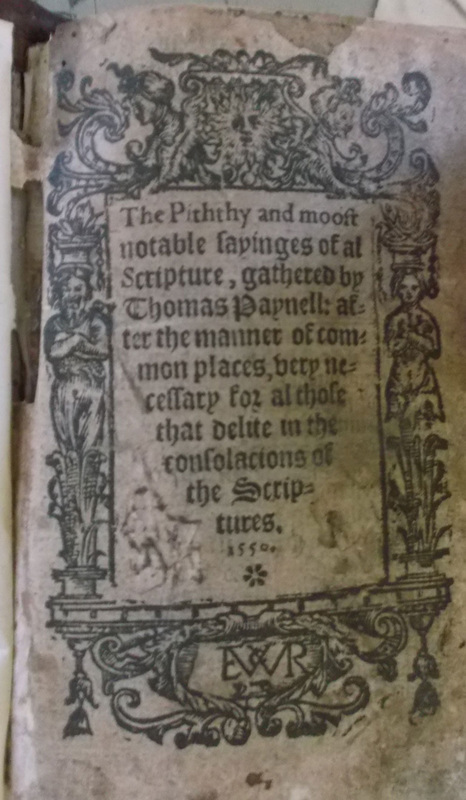 by Thomas Paynell The piththy [sic] and moost notable sayinges of al scripture, gathered by Thomas Paynell: after the manner of common places, very necessary for al those that delite in the consolacions of the scriptures. Paynell, Thomas. [Imprinted at London: At Flietbridge by Thomas Gaultier, at the costes [and] charges of Rychard Kele dwelling in the Poultrye], 1550. The rareness of this book is 1. that it is printed in 1550, 2. That it has the complete New-Testament in English by A Catholic Friar. The Book is the only know copy in Private Hands. So very Rare;- PAYNELL, THOMAS (fl. 1528–1567), translator, was an Austin friar, educated at Merton Abbey, Surrey, where he became a canon. He then proceeded to the college of St. Mary the Virgin, Oxford, which was designed for the education of the canons of certain Augustinian houses, of which Merton was one . He subsequently returned to Merton, and devoted himself to literary and medical studies. His first book, an edition of the ‘Regimen Sanitatis Salerni,’ appeared in 1528, and from that date Paynell's activity as a translator was incessant. In 1530 a Thomas Paynell was admitted member of Gray's Inn (FOSTER, Register, p. 8). On 13 April 1538 Merton Abbey surrendered to the crown, and its inmates received pensions. Paynell accepted 10l. per annum. On 16 Oct. in the same year Paynell was licensed to export from England five hundred woollen cloths, and in December he was despatched, with Christopher Mount , on a mission to the protestant princes of Germany; he was present at the diet of Frankfort on 12 Feb. 1539 (State Papers Henry VIII, i. 604–6, 609, 614). Before 1541 he had become chaplain to Henry VIII, perhaps as a reward for diplomatic services. He seems to have escaped molestation on account of his religious opinions, and remained in favour with Edward VI, Mary, and Elizabeth, to all of whom he dedicated books. Among others to whom his dedications are addressed were Mary (1496–1533) , queen-dowager of France, John de Vere, fifteenth earl of Oxford ], Anthony Browne, first viscount Montague , the lord chamberlain, and William Blount, fourth lord Mountjoy. He was also an intimate friend of Alexander Barclay [q. v.], the author of the ‘Ship of Fools.’ He is probably the Thomas Paynell who resigned the living of St. Dionys, Lime Street, London, on 13 Feb. 1549–50 and succeeded his friend Richard Benese at All Hallows, Honey Lane, which he resigned before 21 Feb. 1560–1. in December or January 1567–8. Biblia. The Bible that is, the Holy Scripture of the Olde and New Testament. Translated by Miles Coverdale. [Marburg: Eucharius Cervicornus and Johannes Soter? ], 1535. 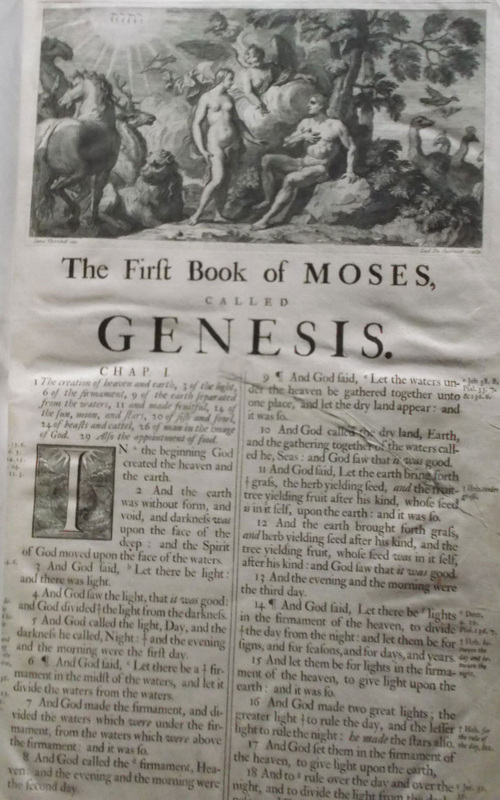 The first edition of the complete Bible in English followed more than a century of strict prohibition against English translations of the scriptures. Although William Tyndale’s pro-Lutheran translation from the original Hebrew and Greek had been suppressed during the preceding decade, Henry VIII’s break with the Church of Rome in 1534 suggested that the publication of a new English translation might gain royal support. Miles Coverdale (c. 1488–1569) compiled this text from Latin and German versions, and more of Tyndale’s prose than anyone at the time would admit. Dedicated to the king with a title page that shows him handing the Bible down to his church and court officials, the Coverdale Bible earned the king’s verbal consent: “If there be no heresies, then in God’s name, let it go abroad among our people.” this edition is not complete, nevertheless its very collectable as is, hence the price I ask for it. 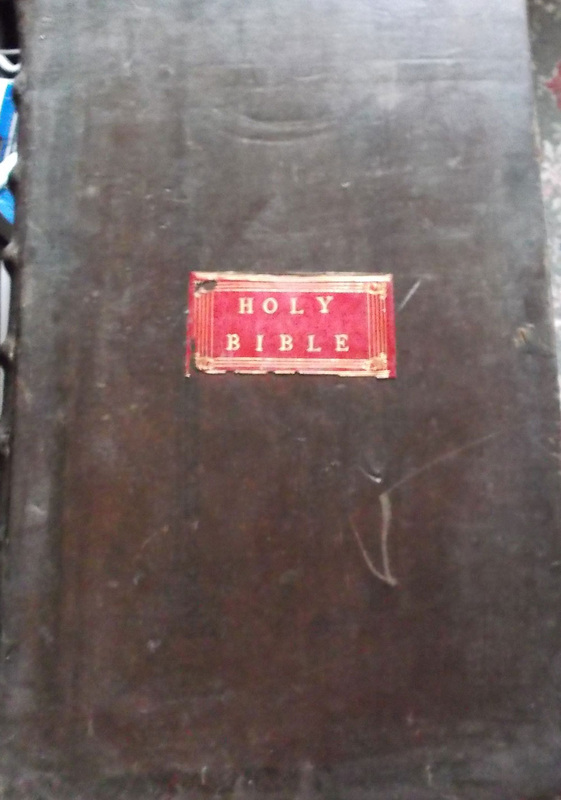 Rebound in the Victorian times, nicely done some gilt tooling and scroll work to the leather, front and back..A tight clean copy of a rare BIBLE. Psalms [Polyglot]. mashafa mazmurat zawawit. Hoc est, Psalterium Davidis Aethiopice et Latine . Psalms [Polyglot]. mashafa mazmurat zawawit. 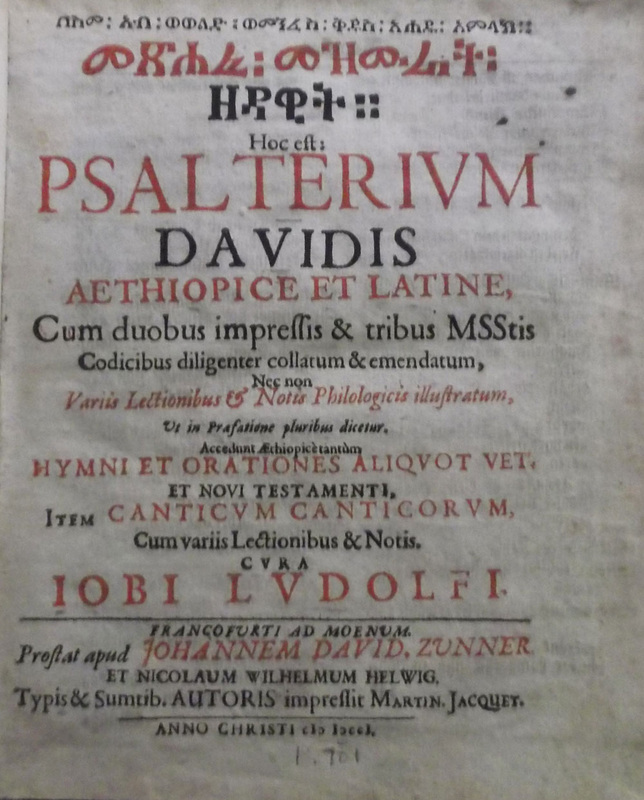 Hoc est, Psalterium Davidis Aethiopice et Latine ... variis lectionibus et notis philologicis illustratum ..., Edition . Jobi Ludolfi, Published in Frankfurt;- by Johannem David. Zunner, 1701, Title printed in red and black;-In Original Parchment bindings;- In very fine collectable condition;- No copies to be found on the world wide web...very scarce/rare. 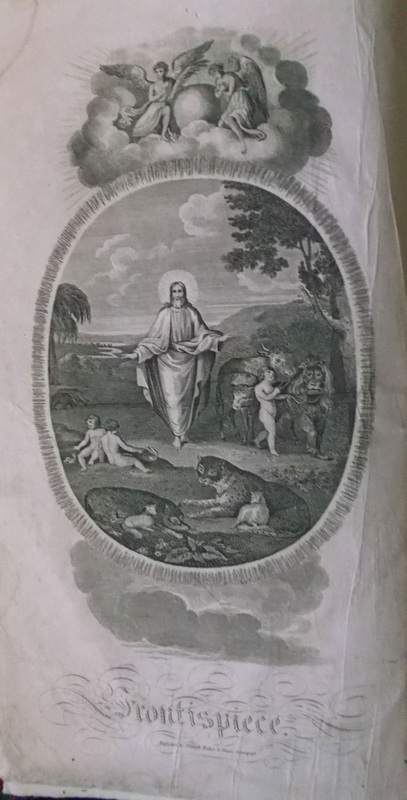 The Holy Bible 1781Published by W. Jackson and A. Hamilton;- Oxford, The Clarendon Press 1781. Elephant Folio, with original brown leather binding, Holy Bible in a red label to the front cover. 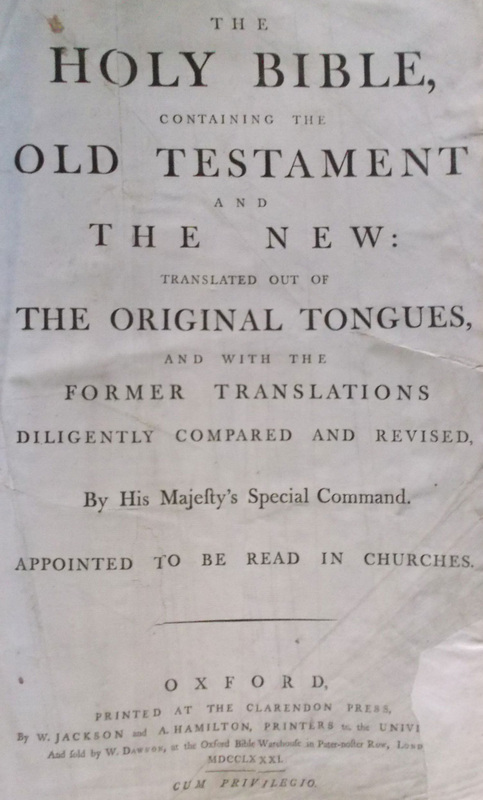 The Dates to the OT and NT is the same 1781;- NOW THIS BIBLE IS NOT LISTED IN HERBERT IT DOES NOT EXIST. BUT THERE WERE 3 COPIES PRINTED AS A SPECIAL ORDER. SO HERBERT DID NOT LIST IT.ITS THE RARIST BIBLE AROUND. The last page has A Table of Kindred and Affinity, wherein whosoever are Related are Forbidden in Scripture and our Laws to Marry together;- A Man many not Marry his...A List..
and A Woman may not Marry with Her....A List..some old repairs, not effecting the text. In fine collectable edition. The Oxford University have no copy.This is the only one in Private Hands.